Silent, taciturn, unemotional Jews murdering White Christians one after another. This took place 200 million times during the 20th Century. The Jew has attempted to eradicate the best and brightest of us for over 100 years. Reverse the roles, and it sounds just like the eyewitness testimony to the Jewish Holocaust Myth. No Rube Goldberg murder machines, no fields of blood geysers, no gas showers, no gigantic death camps, no survivors demanding billions in reparations. The Katyn massacre was a mass execution of Polish military officers, policemen and civilian prisoners of war ordered by Soviet authorities on March 5, 1940. The number of victims is estimated at about 22,000, with the most commonly cited number of 21,768. 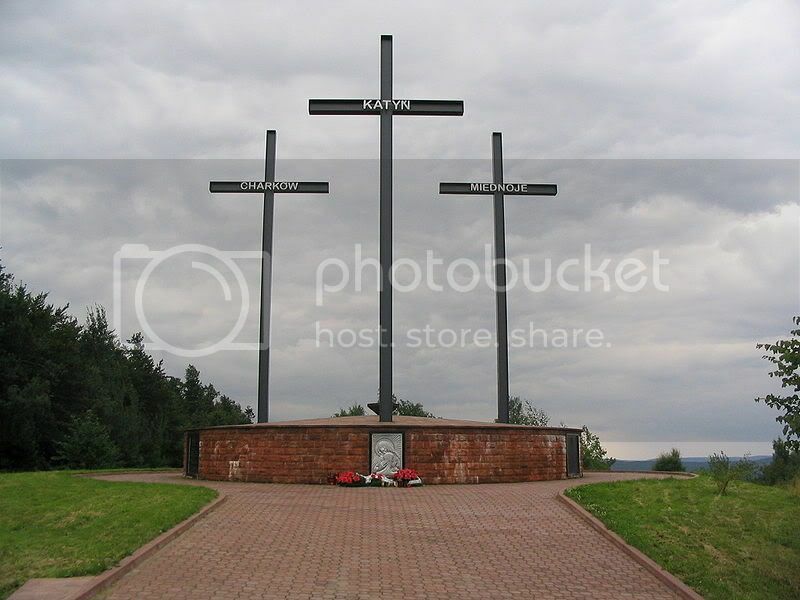 The victims were murdered in the Katyn forest in Russia, the Kalinin and Kharkiv prisons and elsewhere. About 8,000 were officers taken prisoner during the 1939 Soviet invasion of Poland, the rest being Poles arrested for allegedly being "intelligence agents, gendarmes, spies, saboteurs, landowners, factory owners, lawyers, priests, and officials." Nazi Germany announced the discovery of mass graves in the Katyn Forest in 1943. The revelation led to the break up of diplomatic relations between Moscow and the London-based Polish government-in-exile. The Jews are truly God's Chosen, since so many miracles and outright suspensions of Natural Law took place place during their "Holocaust". When the White Race was decimated, a person was shot or starved and they simply died. Their relatives knew that this was a recurring cycle in the war against the Jew, and did not even dream that reparations could be politically agitated for in the future, therefore no claims were ever filed. The truth is that the European Jews were moved to camps to protect their lives from the vicious onslaught against Germany that Hitler and German intellectuals knew was coming. The "Holocaust" myth is a compendium of propaganda from the World Jewish Congress, the American OSS, the British MI5 and MI6, and the World Zionist Organization. The Two State Solution ♦ R.I.P. Newspaper Cartoonist Fired for "Anti-Semitism"
"Your Kidney or Your Life"
Europe says Freedom of Speech is VERBOTEN! Video: "Dispatches - Terror in Mumbai"